Whenever Destiny gets an expansion, the vendors in the tower finally get new weapons in stock. Those of us who obsess over perks and rolls and stats promptly have an anxiety attack deciding which one to buy first. If there's one thing I've learned after two years of Destiny, it's that I'll be able to buy everything I want in due time. We're still in the early days of Rise of Iron, however, so it pays to be choosy. Here are the five vendor guns that have most impressed me, with some thoughts on each. 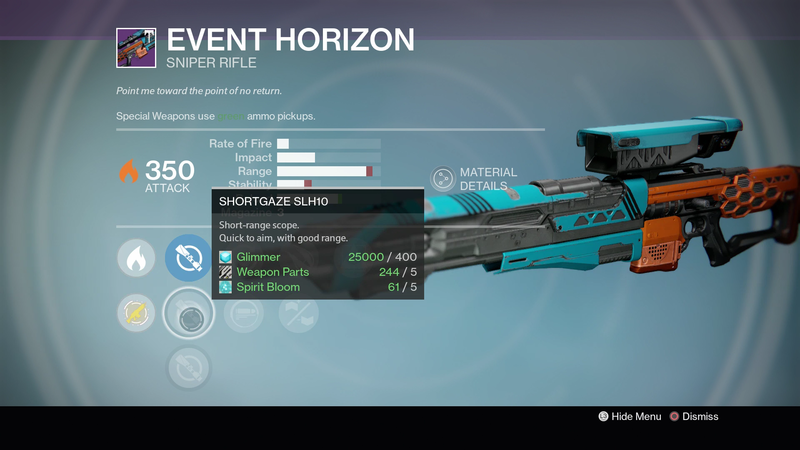 A high-impact sniper rifle with a shortgaze and hidden hand? Sign me the hell up. 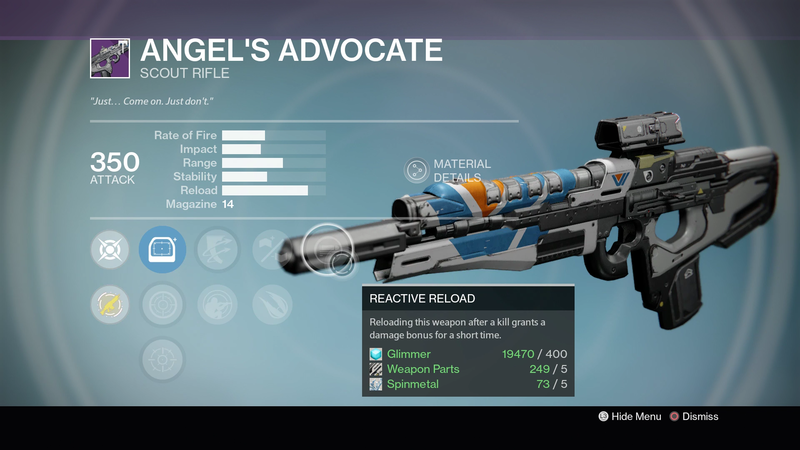 This was the first gun I bought in Rise of Iron, and it was a solid purchase. The clip only holds three bullets, one less than the standard 4, so in the long run it's probably better for crucible than for PVE. It's doing just fine in PVE for me for now, though. Lots of people are flipping out over this hand cannon, since it's a near-perfectly rolled version of the Eyasluna archetype folks have spent the last month or so chasing as a Crucible drop. I have a Byronic Hero with a near-equal roll so I haven't bought it yet, but it's only a matter of time. 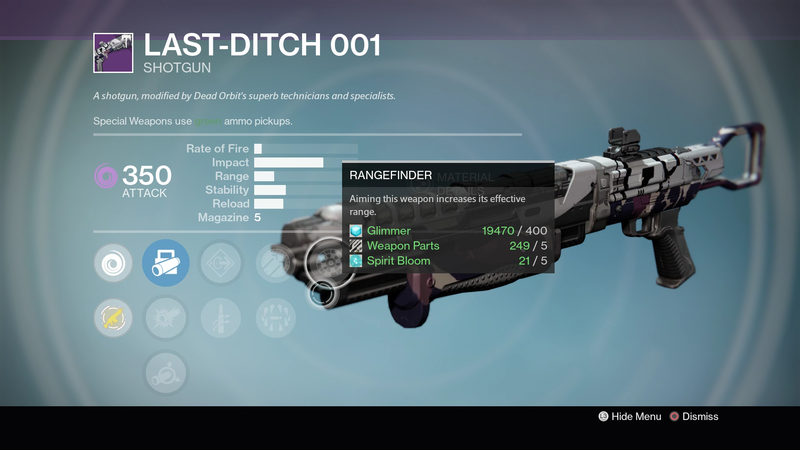 A scout with MIDA-tier impact equipped with a reload perk (outlaw) and a "more damage after you reload" perk (reactive reload). Not a bad combo, and I'm sure I'll get this gun pretty soon. It feels fairly similar to last year's Not Like The Others scout rifle, which you could buy with a similarly cool roll. I already have that gun, so the Advocate can wait for now. Definitely one to pick up if you like scouts, though. Lots of people seem enamoured of the Dead Orbit scout (Keystone 01) as well, but I'm not a huge fan of the high-impact/lower stability archetype. 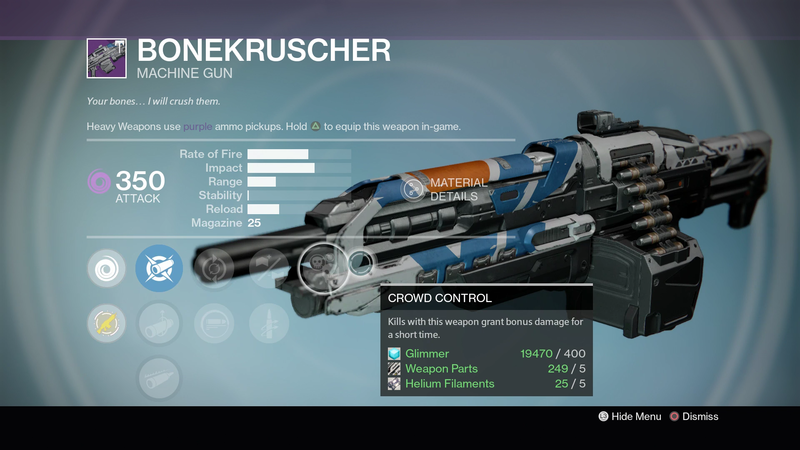 A Party Crasher/Matador-type shotgun with strong perks available at a vendor? Sweet. 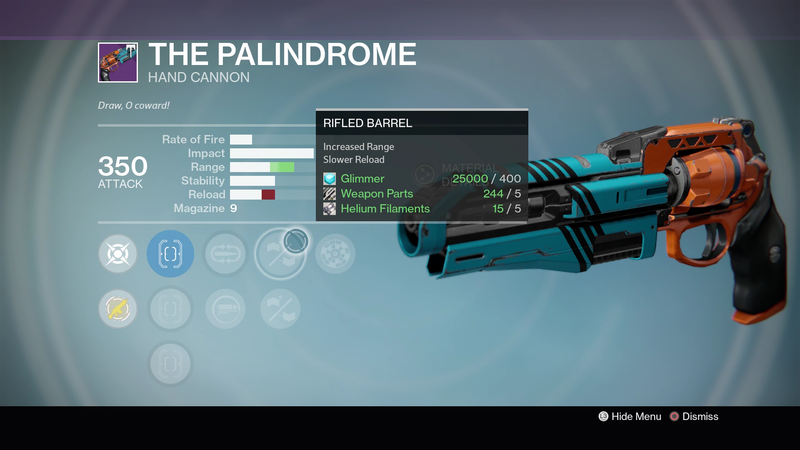 This gun's roll isn't quite good enough for it to become the ultimate Crucible killing machine, but it's still a really good roll on a type of shotgun that seems like it's going to be favoured in the current Crucible meta. Also, always nice to have a void shotgun on hand. 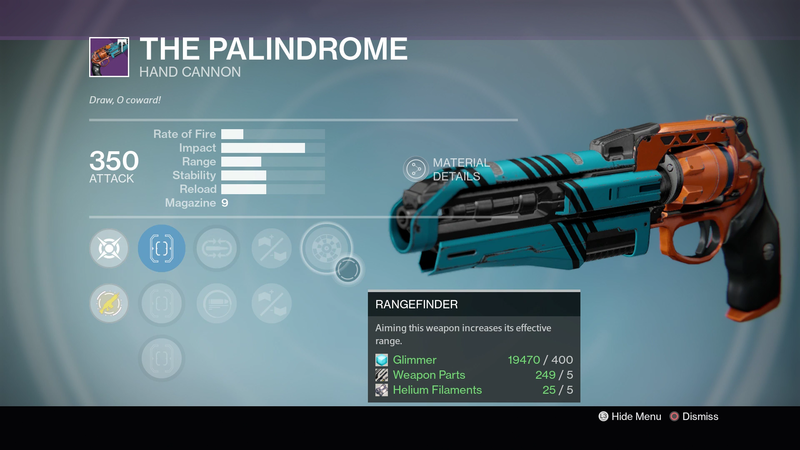 This thing is going to wreck in both Crucible and in PVE. 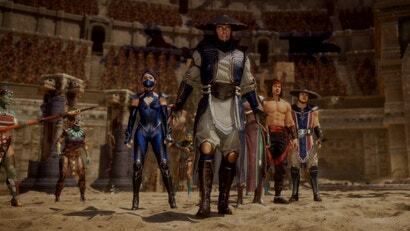 It will do ungodly damage, particularly when crowd control activates. Which will be often. Given that everyone probably already has a Gjallarhorn and will be using that whenever possible, this should be a good year-three LMK to keep it company in your heavy slot. There are several other new vendor guns with good rolls, of course: The Future War Cult's sidearm The Wormwood and pulse rifle The Waltz both look good, and the latter gun will let anyone who wants a Grasp of Malok-style pulse have one without farming the Omnigul strike. It also bears mention that my beloved Hopscotch Pilgrim is back in the Crucible loot table, which might be the best addition in this whole expansion. Even after Bungie nerfed it to death in 2015. If you've put any of the weapons above through their paces and have further thoughts, or if you've found your own favourite in the Tower, I hope you'll share below. Could you explain why these guns are must buys? like what these perks actually do and why they're better than other guns that people might be looking at? If I get the XB1 Destiny collection will I still have the same character or will I need to start from scratch again? You can do an account migration through the bungie website from x360 to x1. If you do that, you will have the same characters.